Looks good, will have to try that someday! And now back to elementary school lunch. 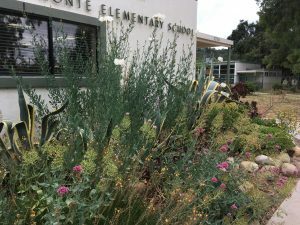 The entrance to Mira Monte school looks really nice right now. 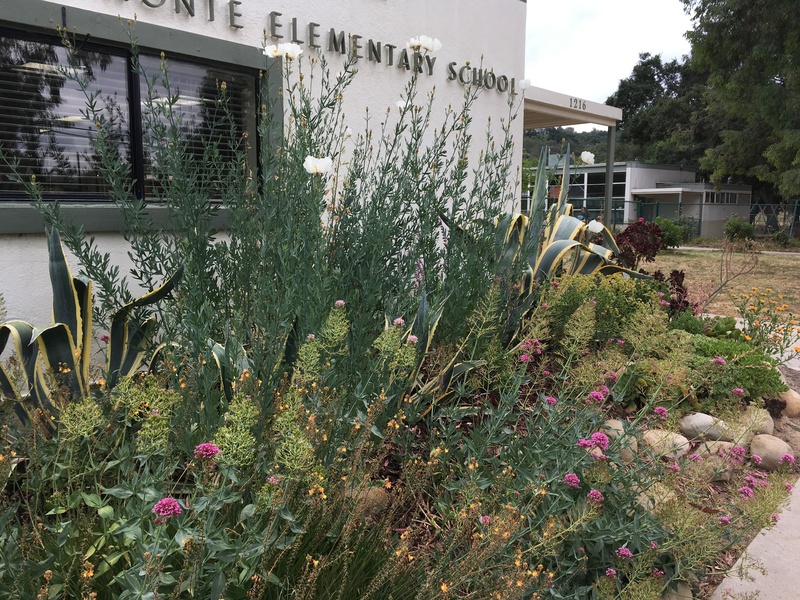 It is a joy to see the beautiful drought-tolerant garden. At this point I think it is appropriate to digress into a little historical exposition for those who are interested. If you search “macaroni and cheese” in Wikipedia, you will learn that no less of an American icon than PRESIDENT THOMAS JEFFERSON is known to have served the stuff at state dinners in the early nineteenth century. Classic recipes from the past 500 years describe mouth-watering tender but perfectly firm macaroni casseroles redolent of bechamel sauce and cheddar cheese. However, this is not what we generally think of when we think of mac and cheese. What we are thinking of is a product that was introduced in 1937 by Kraft foods that features pasta packaged together with a packet of powdered instant cheese sauce, is an unusual bright orange color, and has a shelf life of 10 months. 80 years ago this stuff was a godsend, as first there was the Great Depression and people didn’t have money to buy food, then there was World War II and even if you had money you couldn’t get fresh food due to rationing, and besides everyone was either off fighting the war or busy building bombers, and no one had a refrigerator. 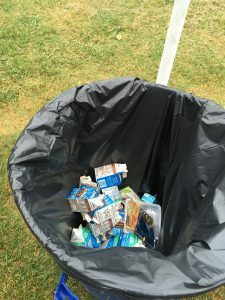 Why then, in these days of relative economic prosperity and peace (for now, anyway, sorry, different rant there…), not to mention nearly universal refrigerator ownership, has the processed orange stuff continued to be so popular? It’s certainly not because it tastes that good. 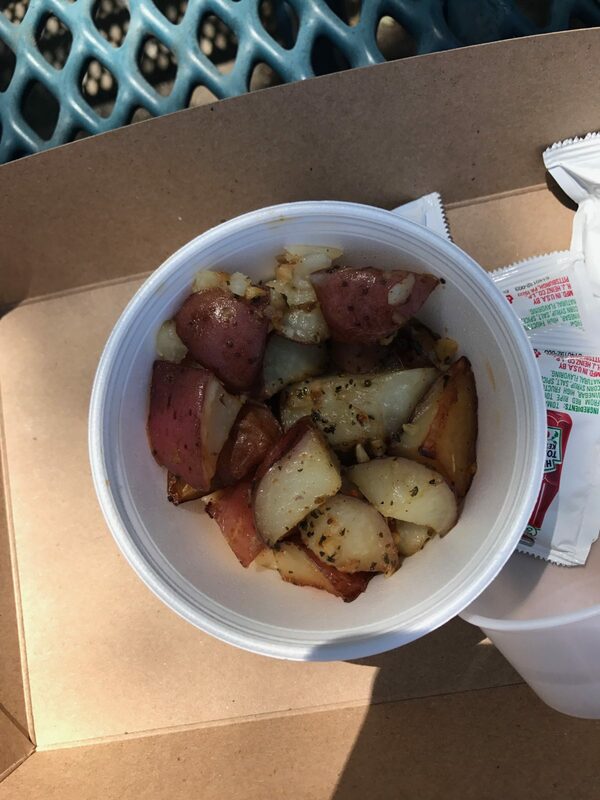 The OUSD version is made with whole grain pasta (by federal law, I believe), which has a weird gritty texture that I suppose I could get used to if I had to. Otherwise, it tastes exactly like Kraft mac and cheese. It was also quite warm, which was my primary objective in choosing it after all. Don’t get me wrong, I have eaten my share of Kraft mac and cheese over the years. Mostly when my daughter was a toddler, I was a single mom working 80 hours a week during medical residency, and I could prepare Easy Mac in the microwave in less than 3 minutes with one hand. I would eat whatever was left over from her bowl before passing out from exhaustion. My life has improved significantly since those early days: I don’t have to work 80 hours a week any more, my daughter is no longer a hyperactive toddler, and I have the time, energy and money to eat something other than Kraft mac and cheese. I believe the answer to the continued popularity of the weird orange stuff is twofold. On the one hand its quite cheap and easy to prepare. And sometimes life is so difficult that Kraft mac and cheese is your best option (same argument for packaged ramen noodles). However, there is another, more sinister reason. 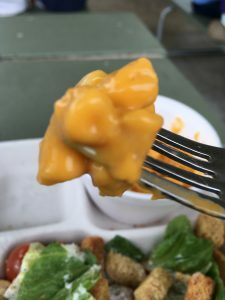 As I surveilled the 3rd and 4th graders eating lunch at Mira Monte, it appeared that every single one of them who went through the cafeteria line had chosen the mac and cheese. They all seemed to be thoroughly enjoying it. Could it be because, being kids, they just don’t know any better? Is there not an economic incentive for companies like Kraft to train our children from earliest toddlerhood to believe that mac and cheese is a bright orange rubbery substance that comes out of a box, rather than a fresh, bechamel sauce and cheddar cheese infused home-cooked casserole enjoyed by US Presidents? 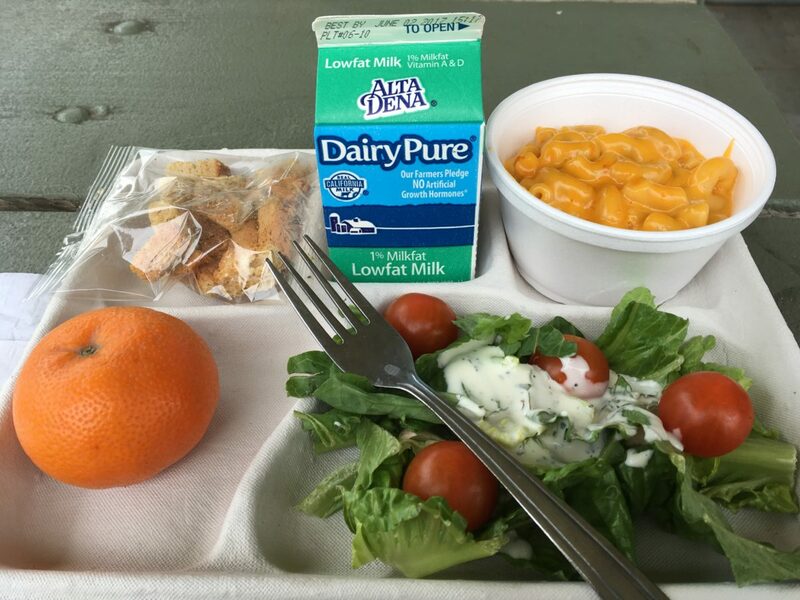 Our nutrition services staff have excellent culinary skills and our district is committed, including financially, to providing fresh, home-cooked meals for its students. 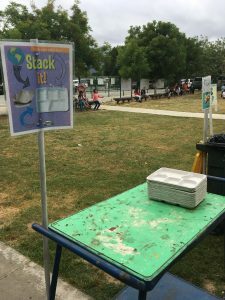 Thus the “cheap and easy to prepare” argument for continuing to serve the weird orange stuff doesn’t apply to the OUSD school lunch. As I learn more about the daily struggle of OUSD and nutrition services departments around the country to provide healthful meals for school children, I have become familiar with a line of reasoning that goes something like this: kids prefer nasty processed foods. This is cynical, defeatist and not accurate. Kids develop their preferences for food over time, and if given the chance to get used to tasty wholesome home-cooked lunches, that is what they will continue to demand over their lives. End of Rant. My meal was rounded out by a tangerine, milk and the ubiquitous romaine lettuce with tomatoes, croutons and ranch dressing. You may have already noticed in these photos an astoundingly wonderful development at Mira Monte nutrition services: FORKS! Reusable metal ones at that. I have personally been present at many Food for Thought meetings where we were told, flat out, that this sort of thing would never happen in a million years and now here it was before my very eyes. The feeling was indescribable. 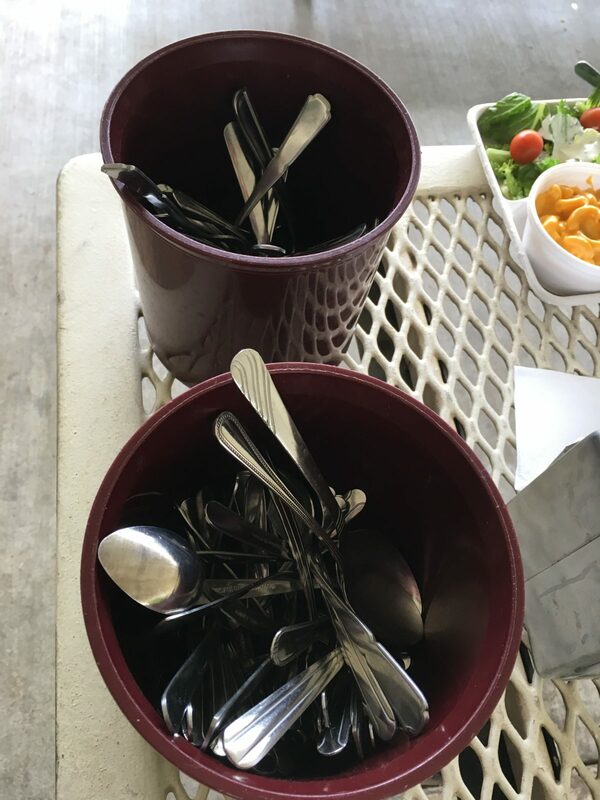 There were also spoons. Not least because of the fork, I was able to enjoy my salad quite a bit. The croutons are kept nice and crunchy in their little cellophane pack prior to incorporating them into the salad, the ranch dressing was tasty, the lettuce was fresh, and the tomatoes were sweet. The tangerine was good too. After lunch I went to investigate what, exactly, they wanted me to do with my used fork and the rest of my trash (couldn’t quite finish the mac and cheese, sorry), as there was a beguiling line of tables and bins set up for this purpose. I got in line behind a very cute little fellow, the top of whose head came up approximately to my elbow, who knew the drill. 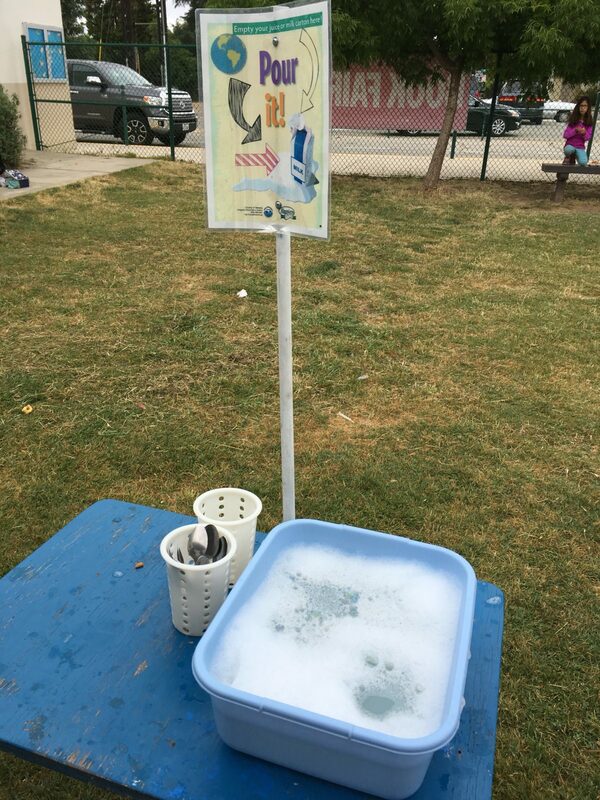 We dunked our silverware (I am becoming misty-eyed just typing that term) in the soapy water and put it in the canister. 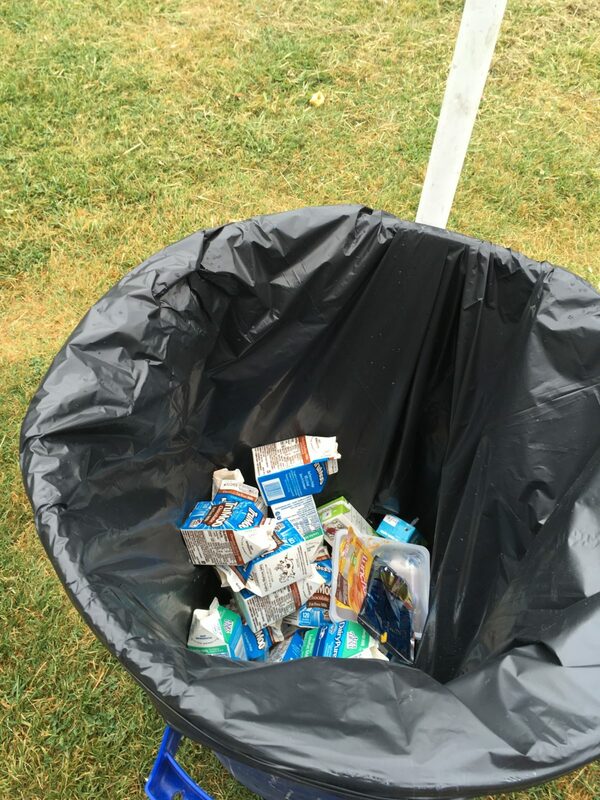 Then we put our milk cartons (having emptied any remaining milk into the appropriate bucket) into the recycle bin. 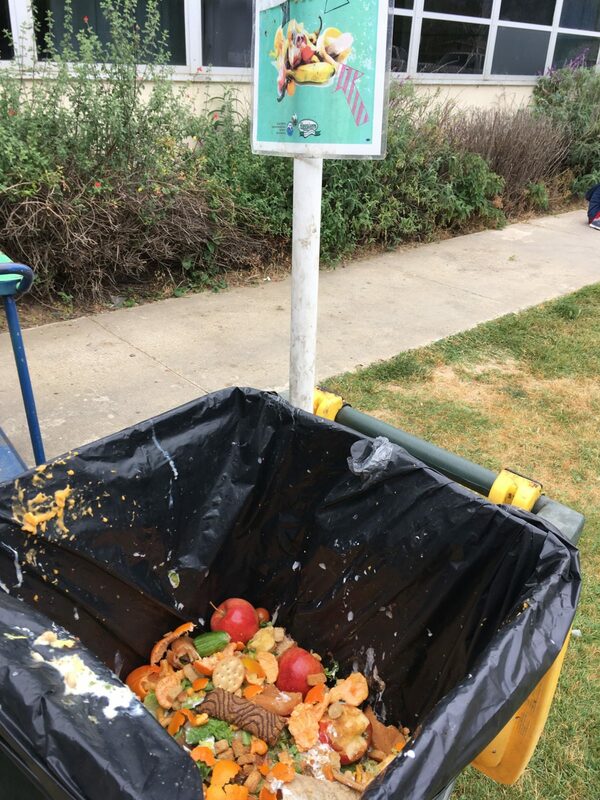 Then we scraped our food waste into the compost bin. Then we stacked our lovely biodegradable trays in a neat pile. He ran off to the playground and I headed back to work. So have a great summer! Make sure you eat lots of delicious fresh produce, go on some hikes, bike, swim, lie around slothfully on the beach, whatever. Lovely piece of writing Helen!